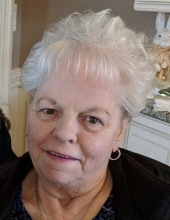 Gloria J. Leonard, 77, of Manville, NJ, passed away on Monday, April 1, 2019 at her home. Born in Jersey City, NJ, she grew up in Branchburg, before moving to Manville 45 years ago. Gloria was an avid football fan, most fondly the New York Giants, and enjoyed keeping track of the score for every NFL game. In her spare time, she enjoyed playing solitaire, going to the beauty salon every Friday to get her hair done followed by a fun shopping adventure around Walmart. Spending quality time with her family is what she cherished most, and her grandchildren were the light of her life. She will be sadly missed by all who knew and loved her. She is preceded in death by her beloved parents, Margaret and Frank Flora Sr. and step-father James Liebel; her loving husband of 38 years, John (Jack) Leonard; and her sister, Vivian Boyle. Surviving are her dear son, Jack and wife Christine of Bridgewater, NJ; her loving daughter, Linda and husband Steven Tumblety of Manville, NJ; two brothers, Dominick and wife Mary Flora of Neshanic Station, NJ, and Frank and wife Judy Flora of Virginia; two sisters, Anna May Flora of Branchburg, NJ, and Susan and husband Cal Salter of Washington, NJ; four cherished grandchildren, Brittany, Tyler, Riley, and Reagan; and her adored bird, Alfie and grandpups Bailee and Sweetie. Viewing will be held Saturday, April 6, 2019 from 1-5pm with a prayer service at 4:30pm at the Branchburg Funeral Home 910 US Highway 202 South, Branchburg, NJ 08876. To send flowers or a remembrance gift to the family of Gloria J. Leonard, please visit our Tribute Store. "Email Address" would like to share the life celebration of Gloria J. Leonard. Click on the "link" to go to share a favorite memory or leave a condolence message for the family.